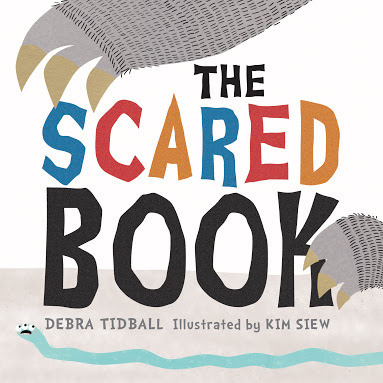 The Scared Book, Debra Tidball (author), Kim Siew (illus. ), Lothian Children’s Books, August 2017. This book is too scared to tell you its story because there are MONSTERS! Can you help? It needs you to RUB away its goosebumps. FLICK away the monsters and FAN away the yucky smell they have left behind. A FUNNY and QUIRKY interactive story. Personally tried and tested on a group of 4 and 5 year olds, I can confidently say that this book is an absolute winner. In similar vein to the quirkiness and interactivity of such books as Hervé Tullet’s Press Here and Let’s Play, Debra Tidball’s The Scared Book is perfect for a hilarious energetic connection. Engaging the reader from the outset, the book introduces itself with a polite invitation to begin. Monsters boldly appear, and that’s where the playful suspense grabs you by the fingertips, prying for more. You see, the book is scared of monsters, thus the reason for enlisting the reader’s help. Tidball’s cleverly thought-out wording allows its readers to link reading with action, integrating animated verbs and expressions on how to get involved. The monsters continue to appear, varying from five-eyed winged creatures to sharp, gnashing fangs, slimy-looking critters and foul-odoured mists. But it’s not as grim as it sounds. Artist and muralist, Kim Siew presents her vivacious monsters with a sweet innocence rather than fierceness, and their brightly coloured and textured appearance brilliantly match their expressive personalities. The mixture of enlarged and weaving fonts, and the pacing of the book allows for opportunities to become emotionally invested and understand strategies for self regulation. The book gives readers scope for exploring and addressing their own positive feelings of elation, gratification and pride, and negative feelings of fear or anxiety. The encouraging finale perfectly sums up the wholesome goodness of this story, sure to inspire enthusiastic repeat reads many times over. The Scared Book is the complete, spine-tingling package for your cheeky little preschool monsters who will relish the elements of humour, quirkiness, surprise, and a dynamic tactile experience. Highly recommended. Thanks Kellie – so kind of you!